But the problem here is though who have excess of 10 6star cards don't technically play the mini game since if I remember KingK saying its more about strategy and card placement... Now I've been lucky to get my card drops 1 7 star and 4 6 star cards. Now those who have literally payed to get there cards wont be playing how it was meant to based on KingK's explanation on the Kong forum. Now theres 3 ways to solve this and make the playing field fair for everyone. 3. Apply a card strength cap of say 50 based on card star level so 10 5 star cards equals 50 deck strength, That will means again those who have brought there cards wont be able to farm it week after week for the 100gems. There are some general strategies with card placement (not always best to order them strongest to weakest in descending as that's the default players will use). Also, once you fought another person, you can try your luck to place your cards against them next day assuming they didn't shuffle their deck between fights. There are strategies on when to use your fight as well which you will start to discover. In general however, it is true that a deck with mostly high-star cards have higher chance of winning on a random battle, and there it was never claimed nor intended for victory to be purely based on strategy. Yeah I know about card strategy (thats how I'm sat in 2nd place), but a person with say 50% card exp boost will never stand a hope in beating someone who can just fight everyone with say 15 or so 6 star cards. All I'm saying is people won't really bother once they have the badges except to get the top 50 for gems if they know it will be a simple win for someone who has brought all there cards, I'm not the only one who is concerned that paying people will always dominate 1st place week after week. I'm not bashing the mini game in anyway I actually like it, but there needs to be away to stop paying players dominating the 1st place spot week after week, even I would if I won it one week be completely fine with being excluded from the next weeks rankings. But with 100gems and a unique otherwise not available ring for 1st place, if 1 person sat there and farmed it week after week because they brought there cards people just wont play it anymore and then making it a pure get the badges and not really bother meaning that part of the expansion had really done nothing but add a few gems and 20e to people. EDIT: Another way could also be to add the Arena Ring for everyone in the top 3 or top 5, then it gives others a chance to also win it. 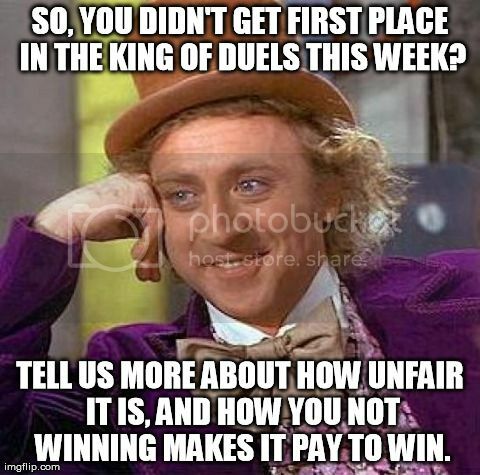 King of Duels is the worst pay2win add-on ever, if you can afford to buy the gem packages that give you 6-star cards, you win KoD! If not, you will still place very high in the rankings each week. Regardless the return on purchased gems is significantly higher than for those that cant afford them. How many people under 90 do you see with 5 star(or better) cards that never purchased gems? Not a whole lot. Im still waiting to see someone with a Fallen card that is under 90. I'll be lucky to make the top 50. I'm not complaining, because I realize that I need to grind some better cards. Maybe you should too. Solomon Grundy wrote: I'll be lucky to make the top 50. I'm not complaining, because I realize that I need to grind some better cards. Maybe you should too.